Even when camping far from home, RVers still want the comforts of home – including TV service, so they can catch their favorite show or cheer on a beloved sports team. "Although it may seem counterintuitive, our market data indicates that people want the comforts of their own home when they're traveling," says Tim Deutsch, executive vice president of Pace International. "We see this across the hospitality industry. 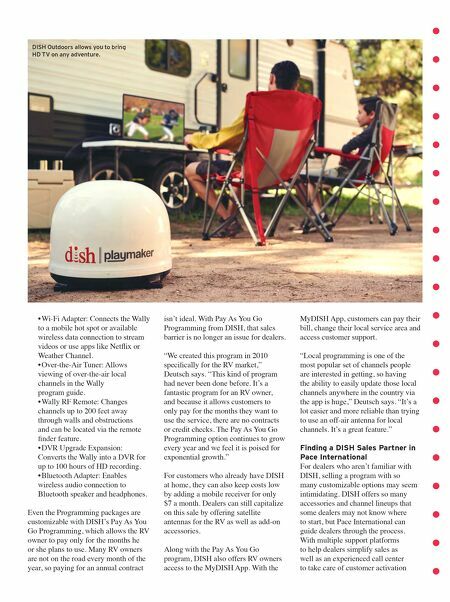 Being able to watch sports and catch the local channels and popular shows helps people feel connected, and DISH gives RV travelers a convenient way to watch high-quality programming no matter where they travel." Offering DISH through Pace International, a distributor of integrated hardware and content solutions, brings RV enthusiasts high-definition TV with flexible programming, anywhere they may be. And if an RV dealer can help its customers find a more home-like experience with DISH, it's well-poised to stand out in a competitive market. In fact, according to the RV Industry Association, the industry produced nearly 500,000 new RVs in 2018, and there are an estimated 30 million RV enthusiasts nationwide. Given these impressive numbers, dealers face a major opportunity to capitalize on a sizeable market. "By offering DISH directly to your customers, you become a one-stop shop that's ready to help its customers with all of their traveling needs," Deutsch says. "People are consuming video content more than ever, and that trend is only expected to grow stronger. We can help dealers put together a solid plan to successfully sell DISH and provide their customers with a profitable, value-added service." 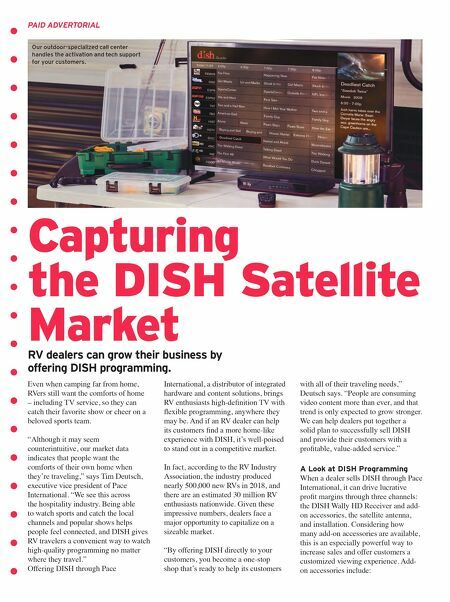 A Look at DISH Programming When a dealer sells DISH through Pace International, it can drive lucrative profit margins through three channels: the DISH Wally HD Receiver and add- on accessories, the satellite antenna, and installation. Considering how many add-on accessories are available, this is an especially powerful way to increase sales and offer customers a customized viewing experience. Add- on accessories include: RV dealers can grow their business by offering DISH programming. Capturing the DISH Satellite Market PAID ADVERTORIAL Our outdoor-specialized call center handles the activation and tech support for your customers.